This is a magical trail full of towering coastal redwoods, lush ferns and rambling streams. 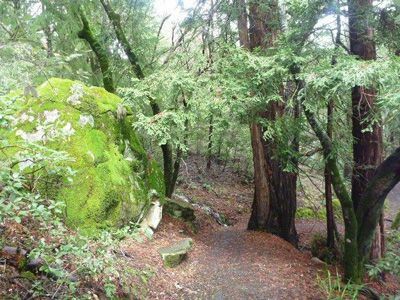 The staging area is Huddart Park and follows the trails through Kings Mountain, Bear Gulch and Wunderlich Park. Come and join us for a fun and memorable day to close out 2016! We will start at 7:30 a.m. - 8:15 a.m. at the Werder Shelter. Park entrance is $6 per vehicle. No dogs allowed in the park. There is an 8 hour time limit and a 2 hour 50 minute cut-off (11:20 a.m.) at 19 Km for the 50 Km distance. Sport-Tek shirt will be included with registration unless a no shirt option is requested. Sport-Tek: This maximum comfort tee has a roomy, athletic cut and controls sweat. This lightweight soft t-shirt is short sleeve and comes in both men and women's fit. All runners will get a shirt. We cannot guarantee your size if registering after December 20th. All late registrants will have an option of the 2016 version if the 2017 size we have left does not meet your needs.